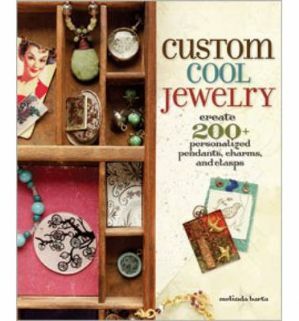 Custom Cool Jewelry / Melinda Barta. Common craft supplies find new purpose with the stunning, nontraditional jewelry designs in this guidebook. Basics items such as embossing powder, collage paper, wire, fiber, and fabric can be used to create one-of-a-kind, boutique-style pieces with a personal twist. From romantic wire-worked dangles and simple polymer clay beads to fabric charms and baked bead collages, the unconventional use of basic supplies provide a wealth of new possibilities for crafters. Each project component is shown in a number of color and design variations, inspiring readers to create their own jewelry pieces, and sidebars share insider tips, basic stringing and wirework techniques, and project and shopping resources.